What is Tuesday News Day? Tuesday News Day is a new campaign from the News Literacy Network to encourage primary and secondary teachers across the UK to discuss the news and current affairs with their pupils for at least 10 minutes every week. Every Tuesday during term time, teachers of all subjects are encouraged to set aside 10 minutes of class time to discuss a news story that matters to their pupils. 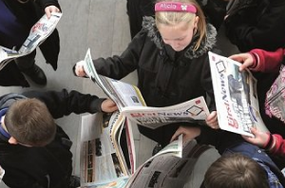 Pupils can either come to class with a news story they would like to discuss or a news story can be chosen by the teacher and/or class from one of a number of child-friendly news sources. Teachers can then use the Tuesday News Day question card resource to guide conversations and get pupils thinking critically about the news story they have chosen to discuss. These can be printed and re-used every week. In addition, the News Literacy Network has pulled together a collection of the most useful resources about fake news and critical literacy for primary and secondary teachers. Why is Tuesday News Day needed?